Except for emergency cases, admission to the hospital is done by doctor's advice during the outpatient consultation. Our staff at the Private Clinics will assist you for your admission, appointment date, financial counselling - estimated cost of the hospitalization, mode of payment, and all other necessary admission preparations and information. Emergency admissions to Sri Ramachandra Medical Centre are arranged through the Emergency Medicine Department located in the ground floor. 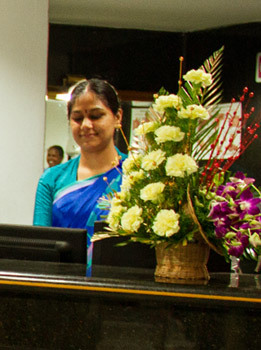 Our admission desk staff will assist you in your admission procedures. The admission counsellor will provide you with details regarding the type of rooms, the cost and also the alternative choice of accommodation. In case of admission into Intensive Care Units / labour room or other specialized areas, our staff will guide you to the annex for a comfortable stay for the attendees within the campus. 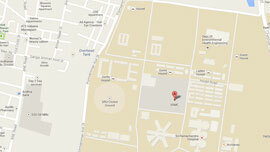 You can call our admission desk on Tel: 45928500 Ext. 423 / 590 (7:00 a.m. to 7:00 p.m. on weekdays and 9:00 a.m. to 5:00 p.m. on Sundays) and our Emergency Desk on Tel: 044 - 40012345 (7:00 p.m. 7:00 a.m. on weekdays and 5:00 p.m. to 9:00 a.m. on Sundays). If you are scheduled for a surgery or procedure, you may need to undergo pre-admission investigations to ensure your fitness for surgery. This includes obtaining your clinical history and conducting basic investigations such as blood tests and / or x-rays. Please inform your doctor if you have any pre-existing conditions such as high blood pressure, diabetes, asthma or drug allergies. Others: Your personal clothing and footwear (Patients during their stay in the ICU will be provided with hospital dress). Note: The Management will not be held responsible for any loss or damage to your personal property during your stay in the premises. At the time of admission, you will be requested to answer a few queries posed by our admission personnel. This information is necessary and we appreciate your cooperation. The facts that you provide will enable us to handle you with a better understanding. An initial deposit will have to be paid at the time of admission for which a receipt will be issued to you. You will be given two attendant passes which should be used for entry into and exit of the hospital at all times. It is important to know whether your treatment expenses are covered under any insurance scheme. If you have insurance cover, please gives us valid information about your scheme at the time of admission, which will enable us to fasten your insurance approval. In case of Emergency admissions kindly submit your Insurance details the next working day, since the pre-authorization should be submitted within 24 hours. If you have TPA coverage, please bring your cashless hospitalization card with a validity along with you. You can interact with the staff at the insurance counter located in the first floor of Sri Ramachandra Medical Centre on Extn.No.410/8499 if your TPA is acceptable. If you are covered under the corporate health plan, kindly bring your authorization letter from the corporate organization. In case of emergency, prior authorization should be submitted to the corporate desk located in the first floor the next working day. 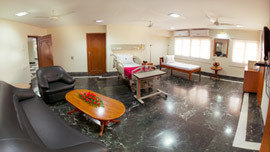 Your bed / room assignment at SRMC is based on your diagnosis on admission and the bed availability at that time. You can select a bed / room depending on your affordability and medical insurance. The admission counsellor will help you to choose your bed / room. Sometimes you may have to wait for a short time till the bed / room of your choice gets ready. Please bear with us for any inconvenience.